In the middle of August we were approached via our Facebook page by an agency who were "casting a major UK supermarket TV commercial and looking for music communities in the north west" and wanted to know whether we were interested. The producer and director of Forever Beta paid a couple of visits to watch and listen to us in our Monday evening meetings and soon afterwards we heard that we had been selected to take part. The next stage was for four of our best players (Ann, Geoff, Howard and Keith) to visit a recording studio and play the song Tender by Blur. Before this however was a lot of work for the players to familiarise themselves with the version required for the advert. This involved a lot of changes and many hours collaborating to make sure they got it right. After a last rehearsal, they were picked up by a minibus and taken to the recording studio. Three of us accompanied them - after all someone had to help eat the delicious salads and sandwiches that were supplied! The next stage was a day where members of SUP were filmed rehearsing in a local pub. 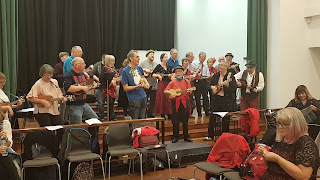 Before that, Geoff and Sue had an early start when they were taken to Mam Tor to be filmed walking across the fields carrying their ukuleles. Unfortunately this scene did not make in into the final cut, but it was a nice ride out on a misty morning. Back in the pub we met the others for our "rehearsal" which was a lot of fun and we were fed well from the catering van in the car park. 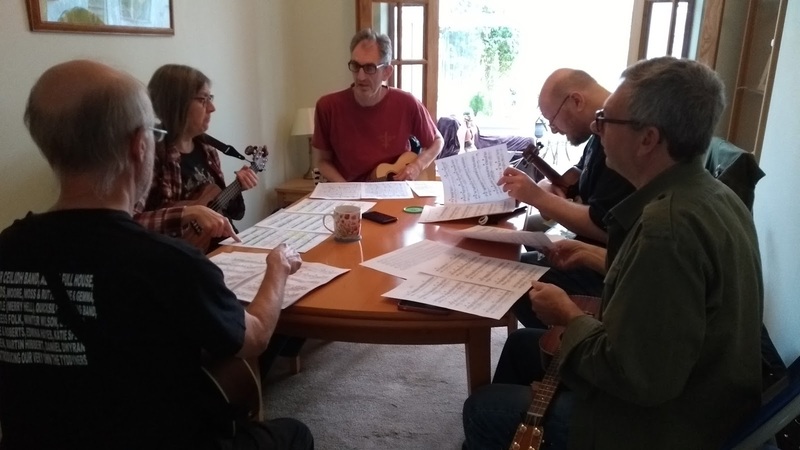 During the day, some of the group (Bernie, Helder, Keith, Malc, Martin, and Nia) were taken off to be filmed in a car and then in a playground - playing ukulele on a slide was fun! Then it was time for the big day - we were taken to Halle St Peter's in Manchester for the Christmas Party. Quite a bit of time was spent waiting around but we got to know members of the other groups and entertained ourselves and each other by performing some of our favourite songs. Finally, after we had been fed (a nice choice of curry, lasagne, hotpot, etc followed by cakes) we were taken to the main hall for the filming. It was hot (we were wearing Christmas jumpers and hats), it was busy but it was great fun. You can also read about the groups who took part in the Advert and listen to or download the Charity Single. 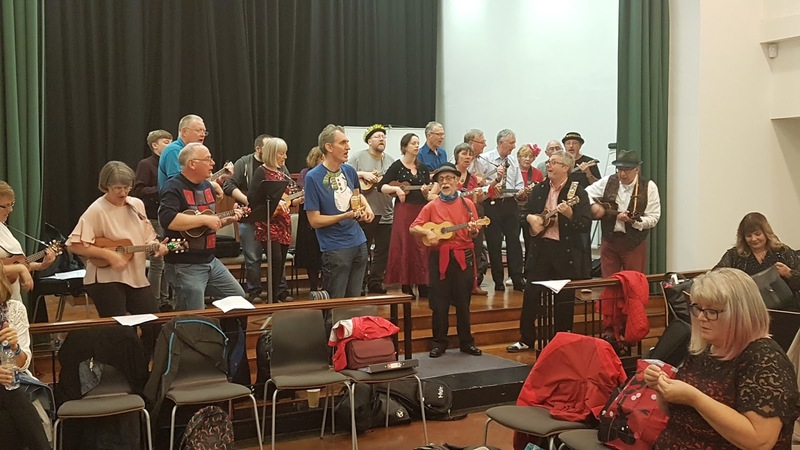 I had far too many photos to include them on this page so I made a Slideshow with photos supplied by members of Stockport Ukulele Players.